Agile Advice is sponsored by BERTEIG (formally, Berteig Consulting Inc.). BERTEIG works to transform people, process and organizations! At BERTEIG, we believe that your organization has the capacity to transform itself to be hyper-productive and highly motivated to deliver the greatest value to your clients and stakeholders. We believe when you effectively engage individuals in your organization you will create dynamic teams who will dramatically improve your results, giving your organization a significant competitive advantage. In order to become more efficient, productive, and produce higher quality work, faster….you need our systematic Real Agility Program. BERTEIG has experience helping organizations in many different industries create effective teams, processes and systems to radically transform the way you do your work. 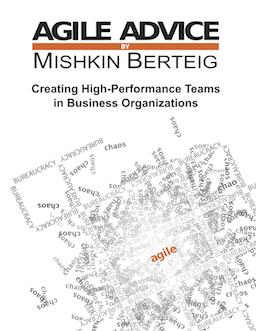 Over the years, Mishkin Berteig (co-founder of BERTEIG) has written hundreds of articles for Agile Advice about his experiences as an Agile Coach, Consultant and Trainer, often with an emphasis on the transformational aspects of Agility. If you are looking for the services of an experienced coach or consultant for your team or your organization, please consider asking BERTEIG for a proposal! Thank you for sharing these wonderful articles for Agile Advice. I am learning this at present and find these very informative. Dear Mr. Berteig, congrats on your very elucidative and educative posts. I wonder if you would allow me to translate them into Brazilian Portuguese, of course referencing your original posts. Cesar, please feel free to do this translation and link back to the originals. I would be very happy to help if you have any questions about any of the posts. Thanks, Mishkin. Hello – is it possible to copy some of your information about Planning Poker, for use in our internal company training materials? We will credit your web site and provide a link in our document. In particular, we want to use some of the step-by-step information about using the Bucket System estimating process. Yes. Please include this text along with the articles: “reproduced with permission, copyright Berteig Consulting Inc. http://www.berteig.com http://www.agileadvice.com”.